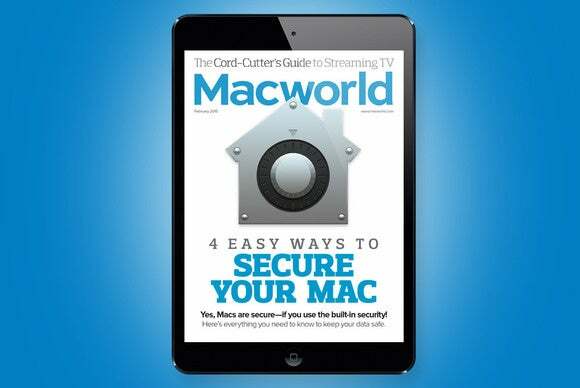 This month, we show you four easy ways to secure your Mac and keep your data safe. • How to choose the best video calling method: Much can be said over the phone or on email, but sometimes face-to-face interaction is best. • Without your Recovery Key, your Apple ID could be lost forever: Do you know where your Apple ID Recovery Key is? Keeping track of it could save your digital life. • The cord-cutters guide to free (and legal) TV streaming: You don't need to pay to watch great TV. We'll show you how. • Apple's Family Sharing is convenient, but it comes with its own risks . • The paranoid person's guide to a complete Mac backup. • How to use benchmarks to cut through marketing hype.